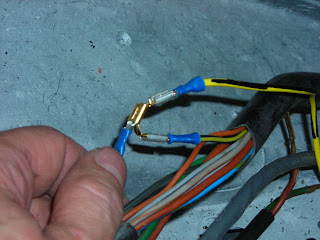 Today was a day for rear wiring. 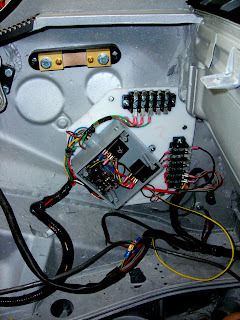 First, I prepared my rear relay board - I placed it in the engine compartment and decided where the best place to put mounting holes and cable ties. 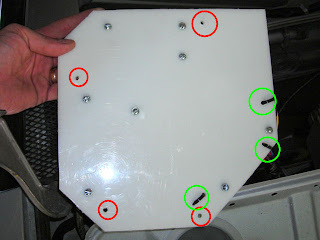 The mounting holes are circled in red, and the cable ties are circled in green. I started with the upper mounting hole. 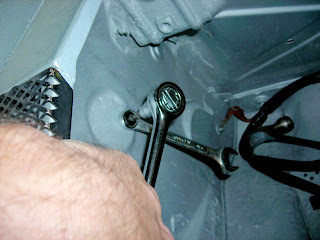 I center-punched its location, inserted a RivNut (shown below), and then attached it. Once I had it moderately secure, I center-punched the other three holes and inserted RivNuts and inserted the other three screws. I also mounted the shunt (close but not exactly where specified), attached the former relay board (just like Tim, I used one of the red wires from that harness rather than extend a new one from the battery cables), and I cut the last corner from the relay board, as it is not needed and just in the way. One final note, after attaching the brake light wire, I taped the whole harness up again and taped the wire against it to prevent it from snagging on anything.